A tornado and pounding rains smashed into the eastern part of Cuba's capital overnight, toppling trees, bending power poles and flinging shards of metal roofing through the air as the storm cut a path of destruction across eastern Havana. Power was cut to many areas and Cuban President Miguel Diaz-Canel said Monday at least three people were killed and 172 injured. The severe weather began Sunday night and continued through early Monday. "We are traveling through places affected by an atmospheric phenomenon of great intensity in Regla," Díaz-Canel wrote on Twitter. "The damage is severe, so far we regret the loss of 3 human lives and treated 172 injured. Several brigades working already in the restoration." Julio Menendez, a 33-year-old restaurant worker said Havana's 10 de Octubre borough looked "like a horror movie." 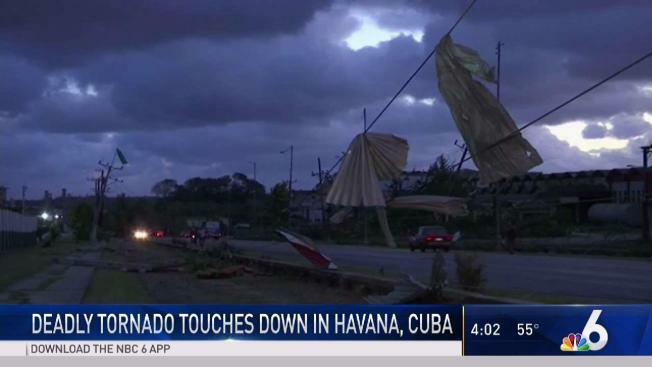 Miguel Angel Hernandez of the Cuban Center for Meteorology said the tornado was a Category F3, with winds between 155 and 199 miles per hour, produced when a cold front hit Cuba's northern coast. More than 200,000 people lost water service, largely because of power cuts that left pumps out of service. Some 100 underground cisterns close to the coastal section of Havana were contaminated by seawater. Three electric substations were knocked out by the tornado, the strongest to hit Cuba since Dec. 26, 1940, when a Category F4 tornado hit the town of Bejucal, in what is now Mayabeque province. The windows in the seven-story Daughters of Galicia Hospital were sucked out of their frames by the wind, leaving curtains flapping in the breeze, and all the patients, new and expectant mothers, had to be evacuated. In the streets, a palm tree more than 30 feet (9 meters) tall had crushed a pre-revolutionary American car. Some of the heaviest damage from Sunday night's rare Havana tornado was in the eastern borough of Guanabacoa, where the apparent twister tore the roof off a shelter for dozens of homeless families. María Esther Linares, 54, was killed while hunting for safe shelter after the tornado broke the roof of the home where she was living with two granddaughters, said her grandson, Yoelkis Dip. Around Havana, cars were crushed by fallen light posts and vehicles were trapped in floodwaters. The neighborhoods of Regla and 10 de Octubre appeared to have suffered some of the worst damage. State media said the city had been hit by winds in excess of 60 mph (100 kph). She and other residents said two of their neighbors had been hospitalized. Groups in the Miami area are collecting donations for Cubans affected by the tornado. Donations can be dropped off at Porto Alegre Brazilian Grill in Hialeah from 11 a.m. to 11 p.m. Tuesday. Travel agency Montes de Oca Travel will also be accepting donations from 10 a.m. until 5 p.m. Feb. 3 at Westland Mall in Hialeah.